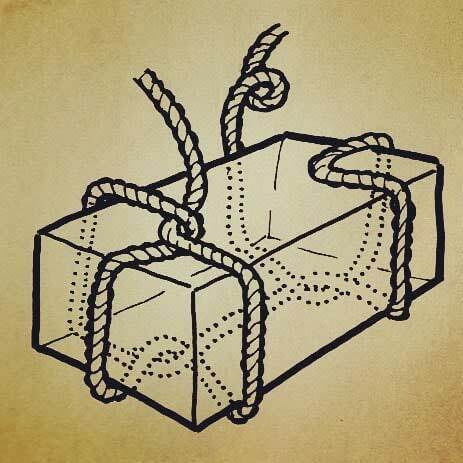 This is one of the illustrations that appear in the instructions for re-tying The Knot-Shop Man books. In several of the other illustrations (not so much this one) I made the careless error of not keeping the lay (the way the component strands are twisted) of the rope consistent, which was pointed out to me by a member of the International Guild of Knot-Tyers (to which, for several years, I also belonged). It was an annoying error to make because the tricky part of drawing knots is getting the knot itself right, not the rope. This diagram shows the playful magic of dotted lines providing the illustrator’s version of X-ray vision.